Stella Timenova began her concert with Beethoven's Moonlight Sonata, op.27.In the beautiful hall of the Archeological Museum, deeply absorbed in the great Beethoven's piece, she built the sonata cycle with great scope, poetically, with dramatic effect and brilliance.Then she presented herself as a romantic, sensitive, vibrant, emotional, virtuoso pianist, devoted to music she is moved by and which she loves deeply.The audience enjoyed the splendid performance of extremely demanding Spanish Rhapsody by Liszt where the great instrumental abilities of the performer allowed her to express the joy, tenderness and ecstasy as well as the mysticism and philosophy of the composer.While in the Chopin's Ballada No 4 with youthful sincerity and courage, she immersed into the poetry, tragedy and optimism-lit emotions.And finally – Pancho Vladigerov's Humoresque op.15, performed with crystally flowing sound, mischievouness, humor and introxication with the swiftness of the mind and movement.The applause was apontaneous and loud.I wish Stella and I expect of her great success in the future, with plenty of delight on the concert stage. Die Flötistin Wally Hase , die Oboisten Céline Moinet und die Pianistin Stella Timenova eröffneten das sommerliche Dozentenkonzert mit dem Trio a-Moll von Carl Philipp Emanuel Bach. Hase und Moinet korrespondierten und dialogisierten im Verbund mit Ihrer Klavierpartnerin aufs Inspirierteste in diesem Trio des Bach-Sohnes, ein Hörgenuss. ...Cosi la giovane pianista Stella Timenova, ospite del concerto d'apertura dell'associazione musicale Francesco Venezze, non ha faticato domenica scorsa a garantire, con il suo bel tocco, un risultato eccelente del lavoro mozartiano in programma. Espressività piacevole, buona preparazione tecnica, fanno di questa pianista bulgara interprete di valore e il pubblico non ha lesinato applausi al suo esibirsi. Stella Timenova trug mit emphatisch aufgeladenem Spiel die intensive Ausdruckshaltung der Geigerin (Corina Belcea, Schubert Sonate D-Dur op. 137) mit. Überaus empfindungsvoll klang Moinets Schumann-Spiel, von Stella Timenova am Flügel mit feiner Anschlagskultur begleitet. Die Flötendozentin Wally Hase, die Fagottistin Angela Bergmann und Stella Timenova am Flügel eröffneten mit Beethovens Trio G-Dur und schöpften in ihrem höchst inspirierten Spiel alle nur erdenkbare Farbigkeit aus der aparten Konstellation zwei Bläserstimmen und Klavier. 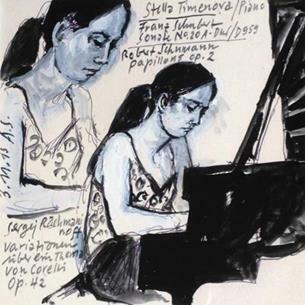 "…Threre were great accomplishments by many of the participants / International Competition "Albert Roussel"-Sofia 1998 /.I cannot name all of them, but it is impossible not to mention Debussy's Sarabande from Pour le piano and Rameau's La Poule performed by Stella Timenova…"
В археологическия музей Стела Тименова разчувства публиката с великолепни изпълнения на Бетовен (Лунната соната) Шопен, Рахманинов, Лист и П. Владигеров.